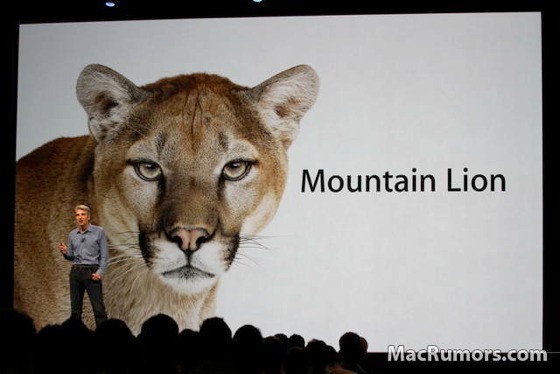 At today's WWDC keynote event, Apple announced a release timeframe and pricing for Mountain Lion, the next version of the Mac operating system which was previewed earlier this year. 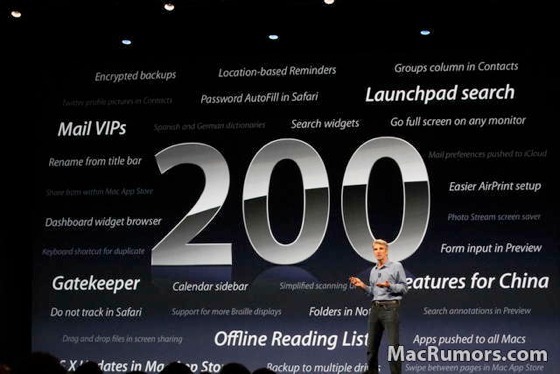 Executives also gave a preview of some new features including dictation, iCloud Tabs, and Power Nap. Mountain Lion will be released in July through the Mac App Store for $19.99 and all Macs purchased starting today can receive an upgrade for free. Did anyone notice the new dock? It looks awesome..
OS X Mountain Lion will be $19.99, which is actually £15.46 factoring in tax at today's exchange rate; the Apple website says it'll be £13.99. yeah that extremely pissed me off. I mean my computer is only a year old with simular specs. Crazy how 14 months is basically out-dated completely. There is a very good reason: you don't want your hard drive spinning all the time. I wonder if there will be a way to enable it for those of us who've installed SSDs in our MBPs. Yeah because my Early 2011 13' MacBook Pro doesn't have the specs to run that Power Nap thing. Thank you so much Apple!!! Once the entire line of apple products have been switched over to flash instead of hd's, the software will be much more compatible. I can see the allure of iCloud for some folks. But for me, the slide towards automatic iCloud integration has more downside than upside. I DO NOT want Twitter, Facebook, or my personal data on someone else's hard drive (i.e. "the cloud") where TBD can access it. You can bet that the government already has a "back door" into Apple's server farms for "reasons of national security". The slide into a "police state" is just getting all so convenient with all this "bait" to tempt people to give up every aspect of their personal lives. And please don't tell me you can "opt out". As iCloud becomes more integrated it also means it is easier to move the data from your HD to someone else's. Whether you do it, or it is done behind the scenes without your consent. But hey, I am just one of those "tin-foil hat paranoid guys" because we all know our government would NEVER force ISPs, phone companies, and tech companies to quietly provide the government alphabet soup agencies with the capabilities to spy on its own citizens.......I mean that only happens in Russia....right? That's $10 cheaper than Lion and you can pay $19.99 to upgrade anything all the way back to Snow Leopard. And it will upgrade all of your personal Macs. Still no love for the Finder? I'm a Linux user with a brother constantly touting the benefits of switching to Mac, but the Finder is such a basic file manager that I couldn't begin to consider switching if I have to do all my file management through the Terminal because Apple, for some unknown reason, thinks a file manager isn't needed anymore now that they have bling such as Spotlight, etc. If I want to copy a folder into another folder (that contains a folder of the same name) I expect it to *merge* the contents, not offer me a total cop-out of a "Replace" button, which wastes the destination folder in preference for the source folder. I'm sorry, but this is the kind of thing that should have been fixed back in the days of 10.1. I could go on about other problems with the Mac GUI that Apple refuses to acknowledge/fix, even with their mountain of cash. It seems to me that Apple only care about the most moronic user these days and anybody with a brain can shove off. Which is exactly what I'm doing until the Mac GUI gets some improvements targeted at power users, and not just hipsters that will get all warm and fuzzy at the latest Apple fad. Yet another disappointing OS X release, Apple. Not all of us are idiots. You also need something between an iMac and a Mac Pro that doesn't force me to a) buy a monitor and b) have a monitor with a stupid shiny screen. I want to be able to swap out my own hard drives, keep my existing screen, and not take out a mortgage to buy a Mac Pro. How about resurrecting the plain old "Mac"? Most underrated announcement of the day - iMessages sent to your phone number will show up on iPad/Mac messages apps. Been waiting for this, as nobody ever sends messages to my apple ID email address.